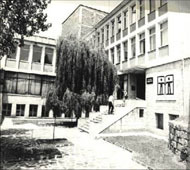 Library "Nikolay Vranchev" – Smolian was founded on the basis of "Hristo Botev" community center. The new building of the Regional Library was officially opened for the readers. Country administration ‘Libraries’ was founded on the basis of the extant Methodical Department a specialized body of the Country Council for Culture, Management and Methodical Assistance of the librarian work in the whole region. 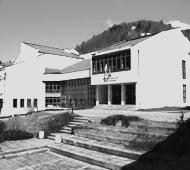 The Library moved to its modern Cultural Center – on an area of 5000 square meters are disposed: two Reading Rooms, a Catalogue Hall, a Free Access Hall, a Specialized Department ‘Art’, a Children’s Department, a Reference-Bibliographic Department, Unique Information of the Local Parts which is at the reader’s disposal, Specialized Sections for supplying and processing of the book-stocks and methodical work. 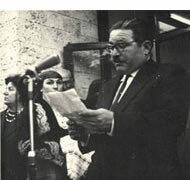 Откриване на новата сграда With resolution № 95 of the Country People’s Council- Smolyan, the Library got its name ‘Nikolay Vranchev’ a researcher of the Rhodopes, a writer and a translator of national importance, a publisher of the library ‘Ralitsa’. On the 25- year jubilee with a decree №2945 of the Council of State of On the 25- year jubilee with a decree №2945 of the Council of State of People’s Republic of Bulgaria the Library was rewarded with a distinguished service order ‘Kiril and Metodiy’- first class. The Library gained a statute of Regional Institute on the basis of a letter of Council of Ministers 153. The Local Automatic System started with 10 working places. места. There are 234 000 library units today. Side by side the traditional Reference- Bibliographic and Library Service, an Automatic Information System has been offered to the readers since 1998. This site is supported by the Foundation "Global Libraries - Bulgaria" within the competition "The Library - an active participant in public life" under contract RD11-00-115 / 24.06. 2016 Ministry of Culture.